What can possibly more be said about the Newton, that hasn’t been said already? I’m not really sure, but something drove me to own one… actually, I owned a MessagePad 2100, and 5 eMate 300s. About every two to three years, one of the big technology media groups (Wired, C-Net, etc) will have one of their staff writers write about the Newton. They’ll tell the tale about how it was the first real PDA, about how initially it had horrible handwriting recognition, and about how that became the subject of a Doonsbury cartoon (and subsequently a Simpsons joke). After the history lesson, it’ll mention how Newton users give up their Message-Pads only at death, and how the community continues to thrive in spite of Apple’s abandonment of the gadget. They’ll note the WiFi driver a guy wrote, and may even write about how the MessagePad hardware has been successfully emulated in a handful of platforms. It was sometime in late 2002. I owned a Palm IIIx, and I liked it a lot. I liked it, that is, until I broke it. On the way to the bus, I dropped on the hard concrete of the sidewalk. It was dead, and I don’t think it was worth the effort to get it repaired. In spite of the loss, when you break something old (and you’re a tech geek like me) you’re thrilled at the opportunity to replace it with something new. 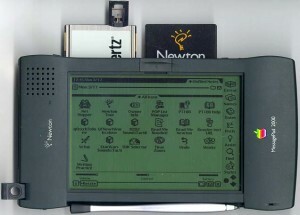 The Newton was discontinued in 1998, so it was about 4 years since Apple had even bothered with the Newton. Before Steve Jobs, the Newton had been spun off into it’s own corporation and then almost as quickly, pulled back in by Apple to be closed up. There were a few sources of Newtons available online. Most of them were companies that had found a niche is handling small user groups. People who wanted to buy outdated, but much loved equipment and accessories. Beyond that was eBay of course. I recall having gone through one of the aforementioned 3rd party suppliers… I had bought a Newton 2100 MessagePad, power plug, battery and a data cable. Ironically, the data cable I got was a serial PC cable, rather than the Mac 8-pin DIN cable. I had the serial adapter left over from my palm. With a wireless driver available, I bought and outdated PCMCIA 802.11 off of eBay. Naturally, I was thrilled when my Newton arrived. As any geek does, the unboxing and plugging in was thoroughly exciting. What I ultimately found though was, I didn’t like my Newton that much. It was a cool toy, but it was also big and bulky and non-standard. The data files (called “soups”) were object databases which could be accessed by any application. This was cool on the Newton, but awkward outside of it. The touchscreen was cool, but not highly sensitive. It required some real pressure to get the Newton to record anything. The handwriting recognition was excellent, but I found I never got into writing comfortably on it. The wireless driver worked well, but I was never so far from my computer as to make it worth while. I got heavily into the Newton community for a while. I had some experience in mold-making and I had gotten into the development stage of making a battery pack for the newton which would accept rechargeable AA batteries and charge them from the device. I even polled the community to gauge interest. I was headed out on a mission for my Church the following May. That would be two years without use, and I could use the money more than the Newton. That’s how my Newton met it’s new user. I put it up on ebay and when the auction didn’t work out, I offered it to someone who’d asked me before, at a price lower than I wanted. Fast forward 4 years. It’s 2006, I’m living down in Salt Lake City, and I’m gearing up for my second year of NaNoWriMo. The year previous I composed my entire novel on a 12″ powerbook that I was baby-sitting for a friend. The powerbook had since gone back to her, and I needed something to write on. I wanted something that had a keyboard, something that was cool, and something that was relatively cheap. 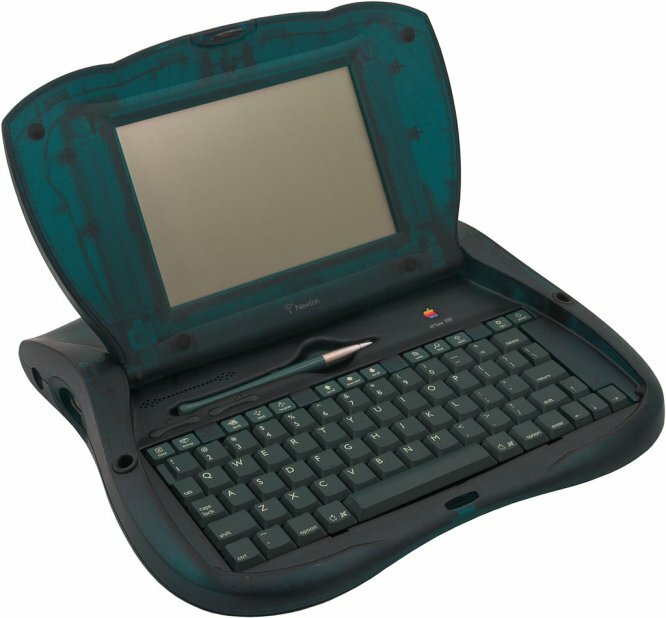 I don’t know what brought on my sense of nostalgia, but I stumbled across the eMate 300, and I couldn’t help myself. However, instead of buying 1, I bought 5. I had this weird plan that I was going to fix them all up and resell them. I’d bought them at a discount, and there were ample instructions on the internet about repairs. So I bought them, and I fixed them up. I sold a few of them to other budding writers, and so far as I know, they were well received by them. The eMate for me was ultimately the same experience as the Newton. It was not quite enough for the time that I had it, or a little too much (weight, size)…The keyboard was too small, even though my hands and fingers aren’t terribly large, and that was along with all my other Newton concerns. It took me several months, but I finally sold my last eMate shortly after I got married. It was sitting in a box in the back room doing nothing. Some interested and excited person who’d wanted to own one came from the University. He was thrilled to have it and, in retrospect, I can’t help but think of myself when I got my first Newton. Every few years, I go look at Newtons, and I usually consider buying one. I have to convince myself every time that I don’t really want it, and I wouldn’t really ever use it, but it’s still tempting to have a piece of Technology that has survived so well in a climate that seems so unrelenting. There were rumors about the resurrection of the Newton OS, and hardware to run it. Elements of the Newton’s makeup can be found in the current version of Mac OS X. A couple of developers of the Newton OS went on to form their own company and develop the OS that runs the iPod Classic. For me, I think my interest finally died when the iPhone was announced. It is just about everything the Newton was supposed to be, but smaller and more powerful. The Newton was a machine ahead of it’s time. Even if I never became attached to it, I’m glad I got to experience it. Note: The pictures above are not mine. I have not owned a Newton Device since 2007 and didn’t have one around to shoot. This article made me all nostalgic. *sniff* I miss my old Newton. I’ve always loved handwriting. I own about half a dozen fountain pens and I find the experience of writing aesthetically pleasing. So writing on the Newton just seemed a wonderful way to bridge my aesthetic desires with modern technology. I already used a Franklin Day Planner so the size wasn’t an issue to me. It is my daily workhorse, business meeting notetaker and email machine. I only use the desktop to cover MS Office and desk research. Less distraction when working on a Newton. It just goes to show how different criteria and circumstances can lead to different decisions.